Thanks to high technical competence, a large circle of contacts and knowledge of the market, Lindroths Maskinservice AB has managed to build a strong trademark. 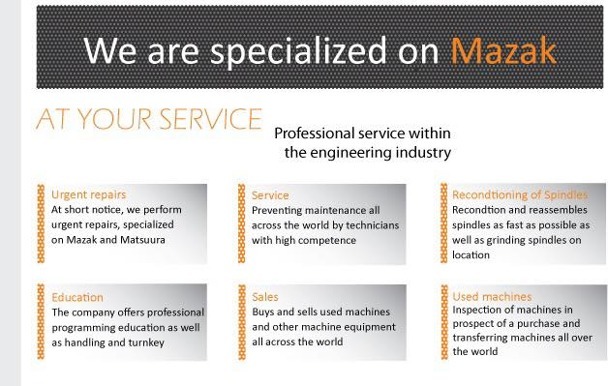 The company is specialized in Mazak and is the biggest single owner of Mazak machines in Sweden. The company was founded in 1998 but have 31 years of experience in the line of business. The head office is situated in Hillerstorp strategically placed in south of Sweden. The concept of the company is unique and centered around contacts all over the world functioning as an obvious marketing channel. In the near future, Lindroths Maskinservice AB, predicts major possibilities for the company. Today the company, have approximately 450 customers, and is constantly working on reaching target groups on an cost-effective base.